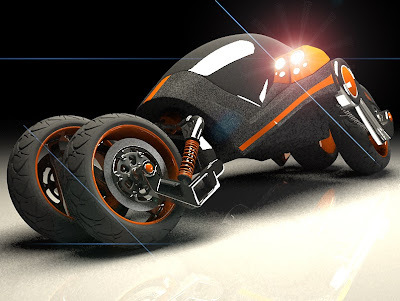 CG Channel: Mariusz Kadewski's "Ball Bike" concept. 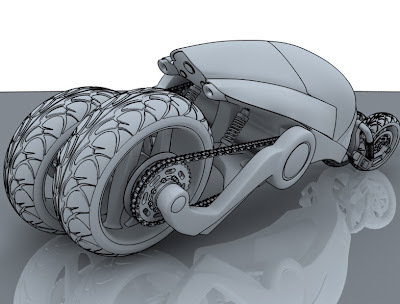 Mariusz Kadewski's amazing "ball bike" concept, created with a scanned pen sketch and then finished in photoshop. 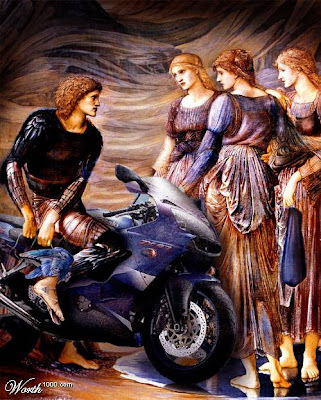 Youtube: Motorcycle riding and opera singing. 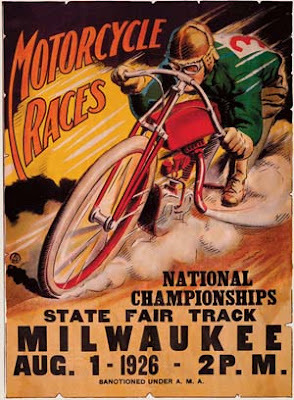 Poster Art: National Championship Motorcycle Races 1926. The Art of John Britten. John Kenton Britten (August 1, 1950–September 5, 1995) was a New Zealand mechanical engineer who designed a world-record-setting motorcycle with innovative features which are still ahead of contemporary design. John Britten was born to Bruce and Ruvae Britten at Christchurch at 10 minutes to midnight and his sister Marguerite just after midnight, so although they were twins they celebrated their birthdays on different dates. Even in birth he showed he was destined to be "different". A dyslexic, he needed to have exam questions read to him at school and during his tertiary education, and his answers recorded by a writer, but that didn't stop him from developing into a remarkable engineer and architectural designer. 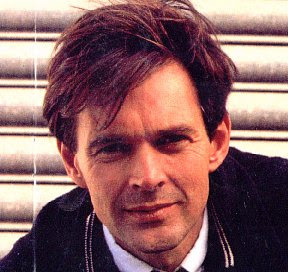 His childhood heroes were notable fellow New Zealanders, Richard Pearse (pioneer aviator), Bill Hamilton (father of the jet boat), Bruce McLaren (champion driver and founder of the McLaren Formula One Team), and Burt Munro (world record motorcycle speedster and subject of the film The World's Fastest Indian). In his own short lifetime, Britten was regularly and favourably compared with all of his heroes. Britten completed a four-year mechanical engineering course at night school before joining ICI as a cadet draughtsman, giving him a wide range of work experience including mould design, pattern design, metal spinning and various mechanical engineering designs. John travelled to England where he worked for four months with Sir Alexander Gibb & Partners on a highway design linking the M1 to the M4. Back in New Zealand he was design engineer for Rowe Engineering, designing off-road equipment and heavy machinery. In 1976, he built glass kilns and went into business as a fine artist designing and making hand-made glass lighting, later joining the family property management and development business. John worked on motorcycle design for some years, developing innovative methods using composite materials and performance engine designs. He created the Britten Motorcycle Company in 1992 to produce revolutionary machines to his own design made of light materials and using engines he built himself, which became famous around the world. 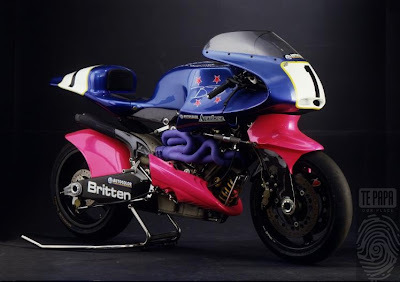 His Britten motorcycles won races and set numerous speed records on the international circuits, and astounded the motorcycle world in 1991 when they came a remarkable second and third against the factory machines in the Battle of the Twins at Daytona, USA. New Zealand mourned in 1995 when John died aged 45 after a brief illness related to skin cancer." Kamishibai (紙芝居), literally "paper drama", is a form of storytelling that originated in Japanese buddhist temples in the 12th century, where monks used e-maki (picture scrolls) to convey stories with moral lessons to a mostly illiterate audience. It endured as a storytelling method for centuries, but is perhaps best known for its revival in the 1920s through the 1950s. 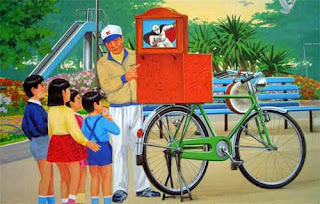 The gaito kamishibaiya, or kamishibai storyteller, rode from village to village on a bicycle equipped with a small stage. On arrival, the storyteller used two wooden clappers, called hyoshigi, to announce his arrival. Children who bought candy from the storyteller got the best seats in front of the stage. Once an audience assembled, the storyteller told several stories using a set of illustrated boards, inserted into the stage and withdrawn one by one as the story was told. 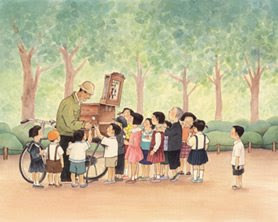 The stories were often serials and new episodes were told on each visit to the village. The revival of Kamishibai can be tied to the global depression of the late 1920s when it offered a means by which an unemployed man could earn a small income. The tradition was largely supplanted by the advent of television in the late 1950s but has recently enjoyed a revival in Japanese libraries and elementary schools." 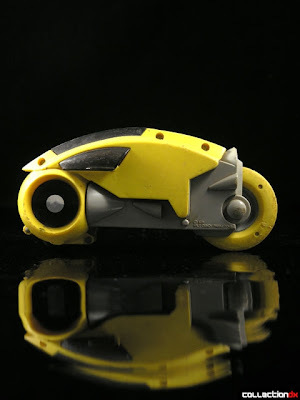 Ode to a yello Lightcycle. 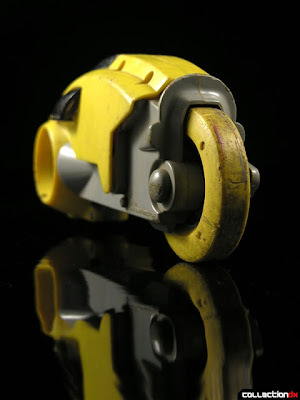 "The Tron Light Cycles were made by Tomy in 1982. They released two versions '“ Red and Yellow; Red being harder to find. Each cycle was made of hard plastic and featured an opening cockpit and rip-cord action. You would insert a long ripcord into a hole near the rear wheel, and then 'œrip' it out. The heavy weight of the wheel made a wonderful noise, and made the Light Cycle act like a gyroscope. I remember placing that thing on the ground and watching it fly across the room; inevitably to smash into some appliance in the kitchen. No matter what I did to this toy, it never broke. Eventually the ripcord got brittle and cracked, but the cycle remained intact." One of the things that made this toy great is that it looks almost exactly like it did in the movie. The only discrepancy is in the cockpit. In the movie, the drivers ride lying on their stomach, but the toy requires the figures to be in a sitting position. Any of the four Tron figures could fit in the seat. In 2002 NECA reissued the Red and Yellow cycles, along with a previously unreleased Blue Light Cycle"
Poster Art: Smoke or Fire. 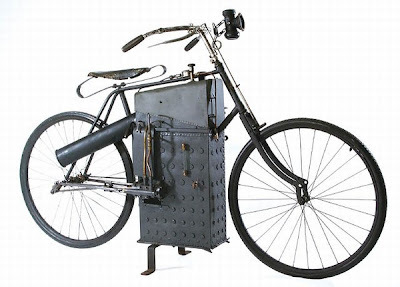 "Date Line - June 1, 1896 - When 73-year-old Sylvester Roper showed up at a local bicycle track in Boston aboard this machine—a steam-powered motorcycle he invented—the young bicycle racers just laughed. Here was this old man riding a strange contraption who wanted to race the local hotshots around the one-third-mile Charles River Park track. It wasn’t until the race was on that they realized the old man had come up with something truly amazing. Roper took three laps, covering the distance in a little over two minutes for an average speed of about 30 mph. Then he tried to go even faster. After all, just a week earlier he had marked off a mile on Dorchester Avenue and completed that with an average speed of about 40 mph. This was the final ride for Sylvester Roper, he died in the saddle with a heart attack attempting more speed out of his little steamer. Roper’s biography and his motorbike is in the Motorcycle Hall of Fame." 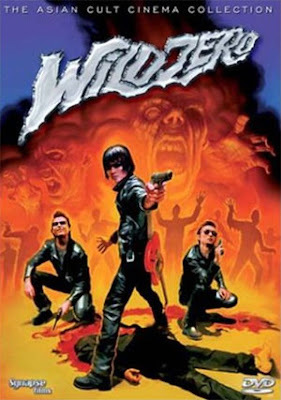 The motorcycle in cinema-Wild Zero..
Wild Zero is a 2000 Japanese rock ‘n’ roll "zombie horror" classic directed by Tetsuro Takeuchi and starring the Japanese garage rock band Guitar Wolf. It borrows many elements from other popular B-movies such as Rebel Without a Cause and Psychomania. Ace, a wannabe rock star, is on his way to a concert of the rock/punk band Guitar Wolf when aliens invade the Earth. As a result the dead rise to their feet in the countryside setting of Asahi, Japan, with an appetite for flesh. Enlisting the help of Guitar Wolf, Ace and the members of the band get entangled in many misadventures with crazy rock managers in very tight shorts, transsexuals, naked women shooting guns in the shower, and bloodthirsty zombies ready to tear them apart. Leather jackets, loud over-modulated music, laser guitar picks, motorcycles, guns, muscle cars, and fire abound. Guitar Wolf, a Japanese trio signed to Matador Records in the US --and self-proclaimed coolest rock band in the world-- star as the well-coiffed hipster heroes. It is also a love story. The music, in a garage punk vein, plays an important role in the film. This film is similar to another movie by a Spanish punk group, La matanza caníbal de los garrulos lisérgicos produced by Siniestro Total (a punk band from Vigo, Spain). The DVD suggests a Wild Zero drinking game, in which a drinking symbol appears every time a character drinks, says "Rock 'n Roll," or combs their hair, or when a head pops, something explodes, or fire shoots out of something. "John Scott’s raw, tough and spontaneous approach to drawing continues to pulse with the undiminished youthful energy of committed rebellion and scathing indictments of the ruling classes. Whatever his chosen medium, primarily drawing and transformed objects, his works are at once apocalyptic and hopeful; they evoke both fear of annihilation and the shrewd instinct to survive; they embody the conflicted state of anxiety that characterizes our being. 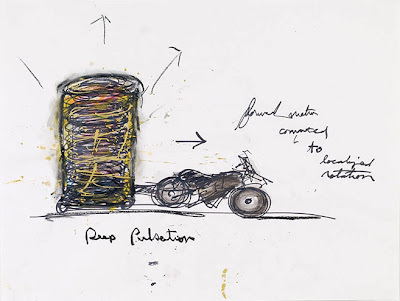 It is also noteworthy that the appeal of his work is widespread and continues to hold relevance for younger generations as well as collectors, galleries and museums. More deeply Scott’s artwork is also intended as an act of resistance to the seemingly endless and inevitable cycles of cruelty, violence and abject behaviours that threaten our very existence. Surely the human imagination has greater potential and is more dynamic than that. By making tangible through his art the vast expanse of his knowledge, thoughts and imagination - by giving voice to the voiceless, by calling forth the dark aspects of our being, his artwork is ultimately intended to reflect optimism and hope. — David Liss, Director/Curator, Museum of Contemporary Canadian Art"
John Scott was the first recipient of the Governor General’s Award for Visual Art in Canada in 2002. Since the 1980’s his rough drawings and sculptures have prophesized the fragmenting of our psyche by the proliferation of technology and war. 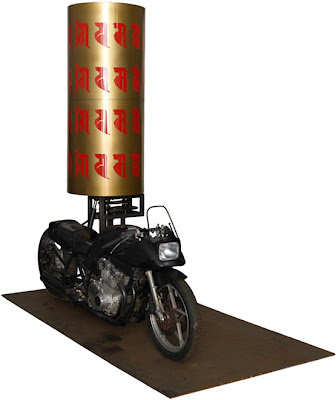 His themes, like the omnipotent threat of destruction, have become current in contemporary art and politics. Scott’s sculptures employ found objects such as cars and motorcycles, such as the iconic Apocalypse Trans Am, in the collection of the National Gallery of Canada. In particular he expresses how machines and technology are extensions of human desire. Other recurring images include warplanes, missiles and rabbit-like figures, which symbolize harrassed and anxious victims of oppression." Etsy: Scrapyard Duck original art photo print. "Several people have asked if I would sell prints of my artwork photos. I'm flattered and will post a few and see what happens. These will be printed professionally on Kodak Professional Portra Endura Paper and signed and dated on the back." 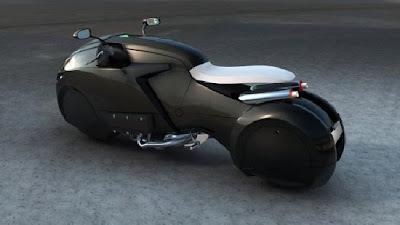 "Enzyme-Design's Icare is the perfect picture of a high-end futuristic bike. With it’s unconventional looks, breathtaking design and an engine (Honda 6 cylinder flat engine and 1800 cm3) that is beyond the ordinary ones, the Icare shall surely keep you captivated. The bike looks more like an alien vehicle, from a different corner of the galaxy. 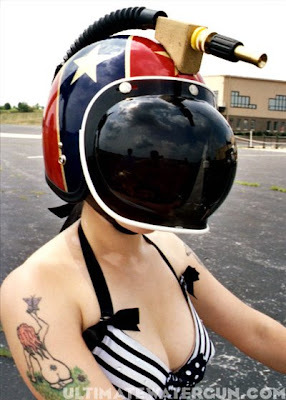 The powerful body would make you feel more secure when riding along the notorious highways. 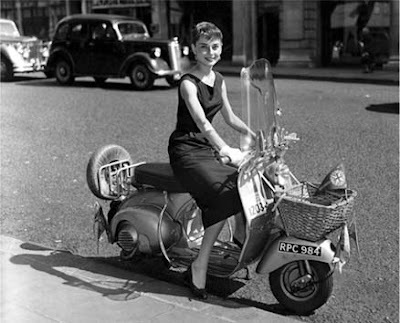 This could very well be the superlative of a motorcycle." 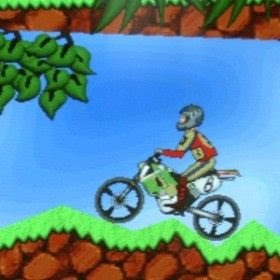 "Elasto Mania (also known as Elma) is a 2D motorbike simulation game for Microsoft Windows, and was originally released in 2000. Elasto Mania claimed to be "based on a real physical model." 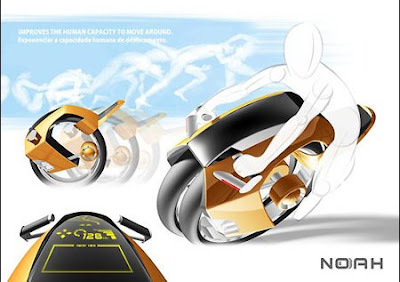 It explores the notion of elastic motorcycles. The goal of each level is to collect every apple spread throughout that level, and then to touch the flower to finish and move on to the next level. Some people play the game to try to solve levels as fast as possible, while others enjoy its puzzle-like nature, figuring out how to solve a difficult level. However, in the end, the ultimate objective is to finish a level in the least amount of time possible"
Worth 1000's Counterfeit Art 11 contest. "The Player" By cameon. Original painting by Sir Edward Burne Jones. From Worth 1000's Counterfeit Art 11 contest. "Will you be wanting the Bat-Pod, Sir?" By Ken Husley Via robojapan. "On the screen, Lucius Fox gets credit for providing Batman with his state-of-the-art crime-fighting accoutrement, from his new and improved Batsuit to his weapons and his different modes of transportation. In real life, however, credit goes to Chris Nolan and his behind-the-scenes design teams, led by production designer Nathan Crowley and costume designer Lindy Hemming, as well as special effects supervisor Chris Corbould and his crew, who turn design into function. 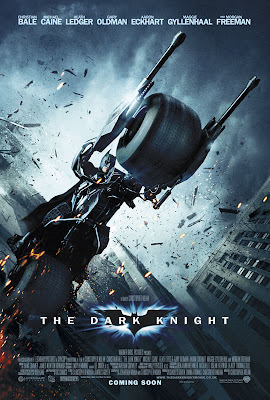 Nolan remarks, "With 'Batman Begins,' we got to show how things like the Batmobile and the Batsuit were developed. At the same time, we didn't fully explore all of the gadgetry, so in continuing the story, what we get to do is show how he becomes even more high-tech, but still in a credible way. What I love about Batman is that he has no super powers except for his extraordinary wealth. Looking at it from that point of view, if you had limitless financial resources, and therefore a lot of power in material ways, how could you apply that to the creation of some amazing gadgets and crime-fighting techniques, all of which are still based on real science and real-world logic?" Nolan and Crowley had previously redesigned The Caped Crusader's legendary Batmobile for "Batman Begins," creating something of a cross between a Lamborghini and a Humvee. The ultimate muscle car, the Batmobile--nicknamed the Tumbler--combines the power and handling of a sports car with a structure closer to that of an armored tank. Riding on six monster truck tires, the Batmobile has no front axle, allowing it to make tighter turns. Despite weighing in at two and a half tons, it can jump as much as six feet high, and up to a distance of sixty feet, peeling off the instant it touches down. The Batmobile can also do zero to sixty in five seconds. 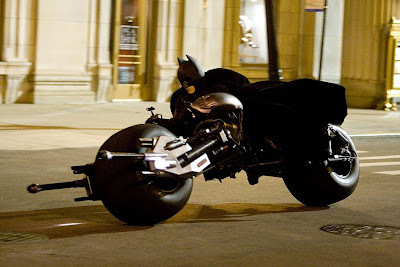 While the Batmobile remains a formidable presence in "The Dark Knight," the film introduces Batman's newest ride, the Bat-Pod, a high-powered, heavily armed two-wheeled machine. "Of course we were going to have the Batmobile back," states Nolan, "but we wanted to give Batman something new: a fresh means of transportation, something very exotic and very powerful looking. It's a two-wheeled vehicle, but it's definitively not a motorcycle. 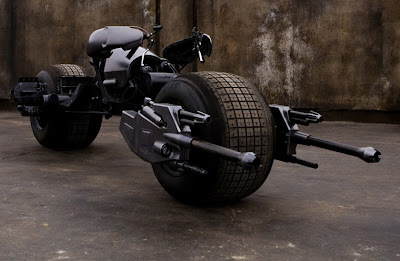 In essence, the Bat-Pod is to the world of motorcycles what the Tumbler is to the world of cars." 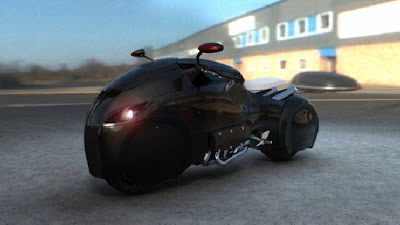 Fast and maneuverable through the streets of Gotham City, the Bat-Pod is also capable of handling all terrains. 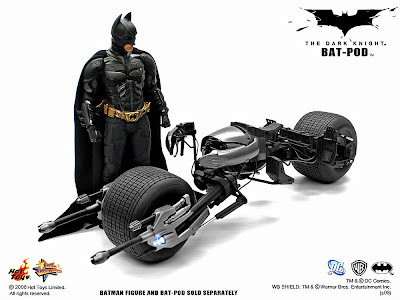 It has the same monster truck tires as those found on the Batmobile and is self-standing, meaning it does not require a foot stand. Well outfitted for hostile situations, it is equipped with weapons on both sides: 40mm blast cannons, 50-caliber machine guns, and grappling hook launchers. The original design of the Bat-Pod was the brainchild of Crowley and Nolan. With little more than the basic concept in mind, the two retreated to their favorite design headquarters--aka Nolan's garage--to work out the details. Crowley recalls, "We figured, 'Let's just go for it; let's build it full-size.' So we did. We got some tools and put together a full-size model out of anything we could find that might fit." 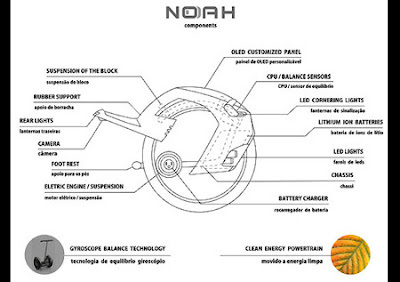 Of course, Nolan and Crowley still had no idea if their invention could actually run. That's where the special effects team, headed up by Chris Corbould, came in. Corbould relates, "First of all, I remember when Chris Nolan first showed me his idea for the Batmobile. I had no idea how we were going to make it work even though it ended up being very successful. So when I got his call asking me to come have a look at something he called 'the Bat-Pod,' I thought, 'Uh-oh, what did you dream up this time?" Corbould flew to L.A., arrived at Nolan's garage, and the first time he looked at Nolan and Crowley's model of the Bat-Pod, "I think he was almost in tears," Crowley laughs. "He looked horrified that he might have to actually mechanize that thing. We kept bringing him cups of tea, and he was just sitting there staring at it, looking like, 'Oh my God, what time is the next flight out?' It was the usual clash of design versus engineering." As it turns out, Crowley was not far off in his assessment of Corbould's state of mind. "I was flabbergasted," Corbould admits. "I stood there silently, pretending I was mulling it over, but the thought going through my head was that they both had to be off their nut. Where was I going to put a power train? And with those massive wheels, would this thing actually steer? There were so many issues." Despite his concerns, Corbould returned to London, where he and his crew began brainstorming ways to bring the Bat-Pod to life. 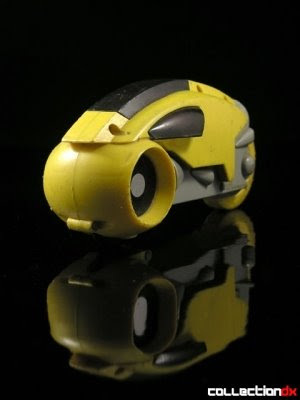 After some trial and error, they developed the final working Bat-Pod, which was surprisingly close to the rough model that Nolan and Crowley had originally constructed. Nolan confesses, "It really shouldn't work, but somehow Chris and his team found a way to do it." 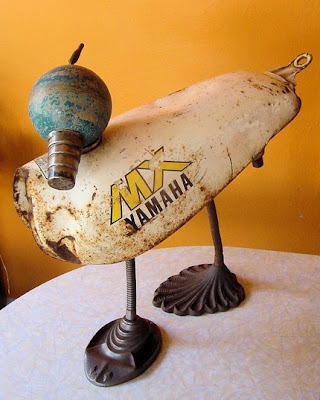 "The funny thing is," Corbould says, "I don't think Chris or Nathan had ever ridden a motorcycle in their lives, so they were completely unaware of the mechanics needed to get that thing moving. In a way it was beneficial because they weren't steered towards a more orthodox bike, even subconsciously. The fact that they had no knowledge of the mechanics helped them create this weird, wonderful vehicle." Actually being able to drive it was another matter entirely. Nolan confirms, "The finished product that Chris and his team came up with was very striking, very effective and worked very well, but it's incredibly difficult to ride and to steer." In order to maneuver the Bat-Pod, the driver has to lean his upper body forward, almost horizontally, and steer from his elbows, rather than his wrists. 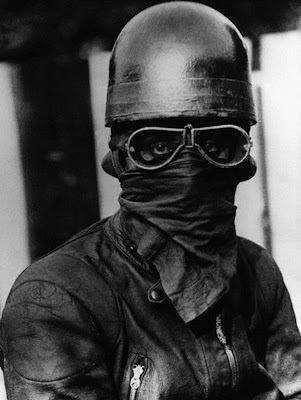 In fact, the only person who was able to master the Bat-Pod was professional stunt rider Jean-Pierre Goy. Corbould offers, "I've worked with Jean-Pierre a couple of times, and he is one of the best bike riders in the world, if not the best. Right away, he totally got in the mindset of learning that machine. He said, 'I'm not riding another bike until I finish this sequence,' because he had to concentrate on the Bat-Pod's unique handling qualities. I'd be lying if I said it was easy for even him to ride, but it looked spectacular when he did, so it was worth the effort." Zen moment: The Ultimate Water Gun. The helmet and bubble shield was new-old-stock, and smelled AWFUL, like old plastic sometimes does. Nevertheless, Tara never complained. Those Pontanis sisters are pretty damn awesome. " The Choprical Fish human-powered party bike. "Sound familiar? A well-cultivated hipster takes his reggae-blaring party bicycle to the streets, to be surrounded at every street corner by the common man of the streets... all of whom drop their 40s in ecological outrage when they discover the music isn't actually human powered. And then it gets ugly. A perfectly greased coiffureage is mussed. A meticulously cultivated sideburn is knocked akimbo. A designer leather jacket is torn around the cuff. And so on. An ugly, desperate scene. It's a common danger facing the humanitarian hipster trying to bring music to the people. 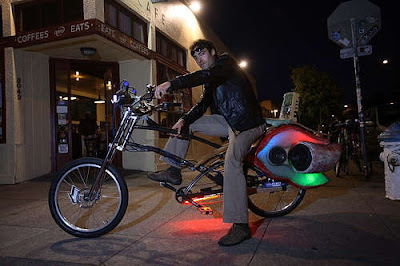 The Choprical Fish, designed by well-known humanitarian Paul "Fossil Fool" Freedman, is a nice attempt to eliminate the problem by adding a battery-powered iPod to the roving party bike. Look at how delighted the plebiscite are in their totally spontaneous outpourings of rhythmic enthusiasm!" Gert-Jan van Breugel's City Swing taxi. "Now this is a fun way to zip around to explore a new city… weather permitting, that is. 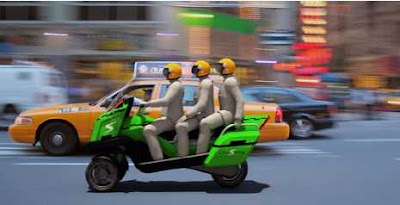 The City Swing is a hybrid motorbike cab painted a vibrant green to reinforce the fact that it’s evidently a more eco-friendly transit choice than a yellow cab. 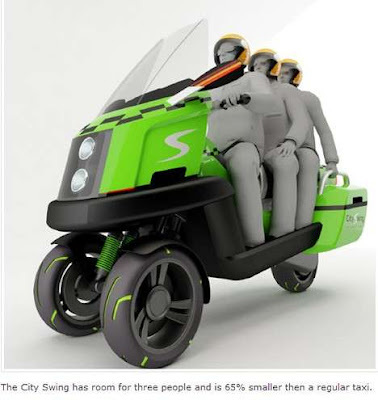 City Swings seat a driver and up to two passengers and are 65% smaller than a taxi, giving passengers more space between lanes and making it easier to weave between traffic." 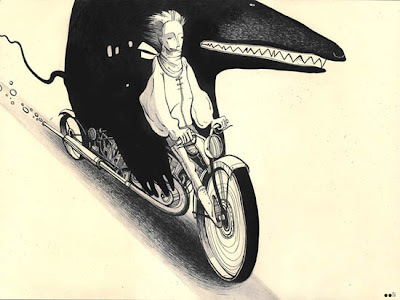 Tineidae's very charming "Me and my Motorcycle"
"The Noah is a motorized unicycle designed to use the human driver as the control device, using how you lean forward, back or side to side to determine acceleration, braking and turning, without the need for pedals or buttons." 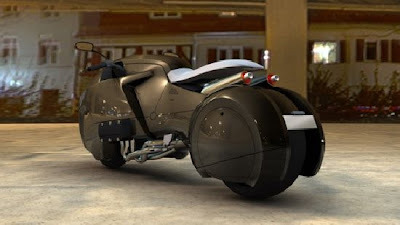 "Bicycletron reinvents 3d-environment by our most experienced render engine - the REAL life. Simple ignore the fact that we´re quoting one of our deeply adored childhood films and games from the 80´s by switching to real players out from the computer straight to a given matrix of game space. 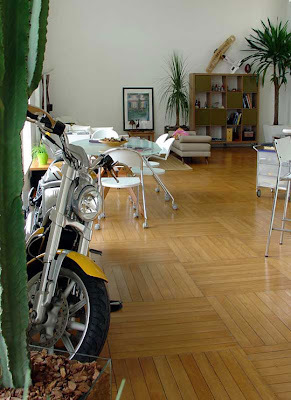 (link)"
A motorcycle in the home. "So how about this as a dramatic display in the home. 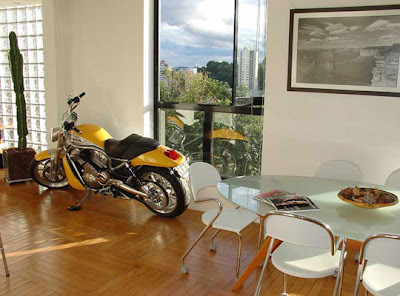 Ronaldo of São Paulo, Brazil not only seems to have an eye for two wheel transportation, but also for displaying it inside his modern appointed loft home. Very bachelor pad chic. Although his bike is the centerpiece of his home, you can also see the rest of his decor in the background in many of the photos." Jamie Tomkins 2020 hybrid bicycle concept. 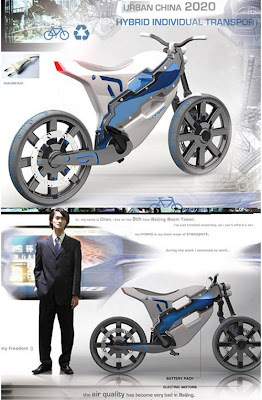 "Jamie Tomkins 2020 hybrid bicycle is a concept vehicle that came out of a GE Plastics Automotive competition. The design addresses China’s pollutions problems, since it would be constructed from cheap metals and plastics, plus the design should capture the hearts of Chinese motorists. You know, since it looks like a toy and all. It seems like a natural evolution. As a kid, you have your Big Wheel, then when you grow up you graduate to this two wheel version." "It was the challenge I was looking for. 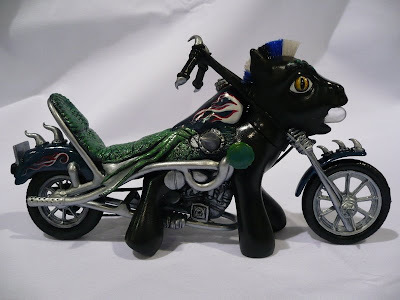 I had a few commissions to finish before chopper and when she said she was going to the MLP fair we decided that it would be awesome to enter the chopper in the custom contest. She wanted the bike to be dragon themed, but I think that it worked. He is created with apoxie sculpt. I spent about 20+ hours on this custom and it was well worth all the work. He does have a working LED headlight that is really bright lol. His wheels also turn. 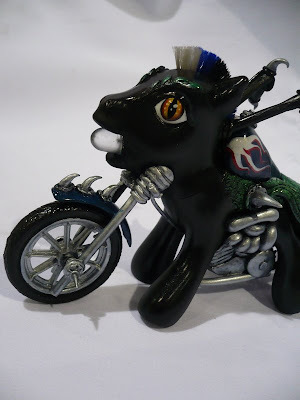 the chopper won 1st place in the open category at the MLP fair." "The motorcycle refugee is an Autobot in the Cybertron portion of the Unicron Trilogy continuity family. The refugee is one of the many civilian Autobots in hiding on the planet Earth following the evacuation of Cybertron. She enjoys taking long rides out in the desert, where there are no humans around to see (since a riderless motorcycle is kind of a giveaway)"
Youtube: Honda FALCON 750cc monowheel. Harry Martin's Road Rash comics. 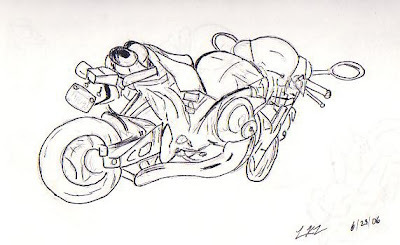 Road Rash Cartoon is a self-syndicated comic strip that looks at the lighter and darker sides of motorcycling. This cartoon is updated about once a month. Road Rash currently appears in magazines, newspapers and websites. 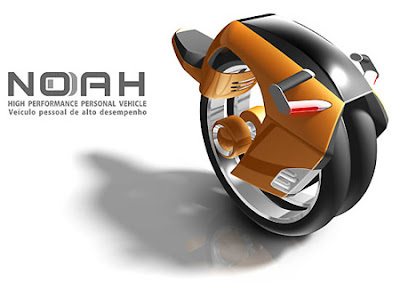 blendedhead's superb "vehicle concept" originally created a his diploma project. The Art of Bill Vollbrecht . 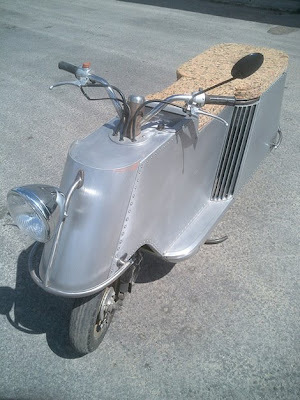 modernmechanix: The Scooter Goes to Town. Youtube: Bikers zip into hyperspace. The ErockIT serial electric bike. flickr: Manilla Imperial Motors sales. 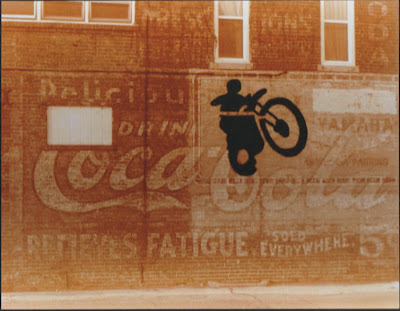 The Stencil Revolution is upon us. Zen Moment-its all uphill from here. Television: The Return of the Saint's BMW R100RS. The Art of Brian Prince. Monowheels in comics-The War Wheel. The Track Bike Enters Its Ironic Phase. 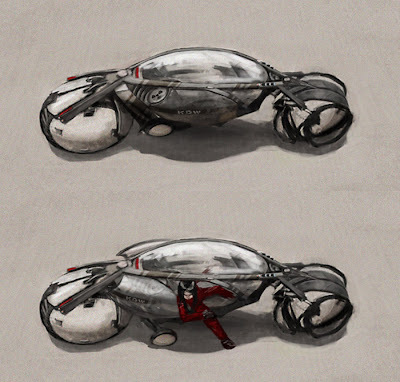 Daniel Bailey's "Speed Racer" motorcycle concept. 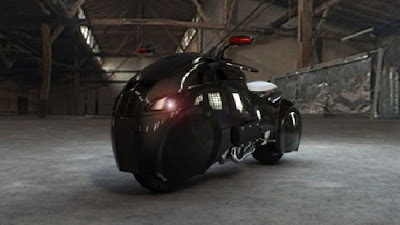 The motorcycle in cinema-Burst City. Fritz von Opel's Rocket bike. The Art of Lee Stoetzel. flickr: The minibike ballet at Palais de Tokyo. Saint Thomas Academy’s Safer Electric Motorcycle. Suzuki Crosscage concept now a working prototype. The Art of Scott Listfield. Motorcycles and scooters pollute more than SUVs. It all goes together somehow. The Art of Patrick Janicke. The Art of Eldar Kadymov.